Stephen Addiss, a scholar-artist-poet, is Tucker-Boatwright Professor in the Humanities: Art at the University of Richmond. 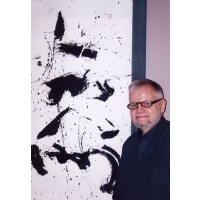 His own haiku as well as translations have appeared in many magazines, journals, and books, and his calligraphy and paintings, including haiga, have been exhibited in Asia, Europe, and the United States. Awards and Other Honors: Honorary Curtaor of the American Haiku Archives, 2009-2010. Calligraphy (Shirley Day Limited, London, 1975). Credits: sniffing the air" - Simply Haiku V:1 (2007); "by the hydrant" - Simply Haiku V:1 (2007); South by Southeast 12:1 (2004); "after the storm" - South by Southeast 11:3 (2004); "winter afternoon" - Modern Haiku 35:2 (2004); "gunmetal sky" - Reeds: Contemporary Haiga No. 1 (ed. Jeanne Emrich, 2003).